I have been helping a lot of people answer questions about basic spending and budgeting habits lately so I thought it was time I pull this gem out of the blog archives. It's a great book I read back in 2009 and it's a very simple and conservative way to get right financially. Enjoy! 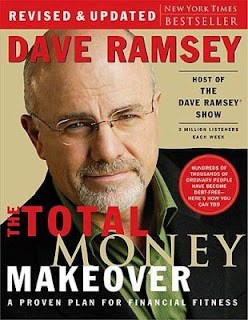 The book this week was The Total Money Makeover by Dave Ramsey. This book can help anyone who reads it. I feel like a lot of people have a immense amount of misguided pride about personal finance. People won't pick up a book like this one because they hate to think that there is anything wrong with the way they are spending their money. Well, I hate to break it to you, but if you are like 95% of Americans, you are using your money unwisely. People don't learn about how to make the most of their personal finances in this world. And if they are one of the lucky ones that actually did get taught the basics of how to manage their money, they were most likely taught by someone who didn't have their own finances figured out. Ramsey's book is a 7 step plan to provide "financial fitness." The basics of the 7 step program is to get rid of all your debt and live right. There is an incredibly powerful trend in this world to live beyond your means, finance your whole life, and live real close to paycheck to paycheck. It might be because someone is trying to keep up with the Jones' or because someone never told them that it was wrong, but there is a better life. Ramsey's book has a lot of success stories of people who did the steps and turned their life around. I'm not one for sentiment, but the idea is that this program really works. The steps are: make a $1000 emergency fund, paying off ALL your debt, make your emergency fund larger (6 months of living), save towards retirement, save towards college, and finally, pay off your mortgage. Once you have that done you will be completely financially secure. Most people can't imagine not having any debt because that is just not what they were taught. But it is possible and you will be so much better off if you get it done. The trick to getting rid of your debt- step 2- is to figure how to just get by for awhile (groceries, mortgage/rent, not a lot extra) and put all the money you have left towards your debts. Start with the credit card with the smallest balance and just keep going until every single one of your debts is gone. This includes student loans and car payments. From then on you will be paying cash for everything... your clothes, gas, and even your cars. It can be done, but it means living within your means. Quick side note within the book - The average multi-millionaire doesn't buy a brand new car off the lot. They buy a 2 or 3 year old car that was previously used as a lease. It costs over 60% less and all the bugs have been worked out. Now to the millionaire part! If you are living within your means with absolutely no debt you have the opportunity to invest in your retirement. There is nothing more powerful than the power of compound interest. The Standard and Poor 500 has had an average return of 12% for the last 70 years. We aren't talking about day trading here. If you are going to be in it for the big bucks you have to look long term. Find a good mutual fund and invest every month, as if its your new car payment, and you will see huge rewards. Let me illustrate this for you... If you invest in a Roth which grows tax free at 12% interest, with $3000 a year, starting when you are 30 years old. You will have $873,000 tax-free at the age of 60 years for retirement. Not to shabby! Or another example from the book if you invested $464 into a different mutual fund (Roth caps out at normally $3000 a year) from the age 25 to 65 you would have $5,448,854.45. This book is not about getting rich quick and it's not about being adventurous and opening up a business. Anyone, seriously, anyone can do this... You just have to throw your pride away and really do it. It will probably be painful making the transition to living within your means and people will probably tease you because you aren't spending money as frivolously as they are. But I guarantee you if you read this book and take Ramsey's words to heart, you will change your life forever. You will have a wonderful retirement, your kid's college will be paid for, and you will have money to really have fun with. A lot of the books I have written about in this blog have not been for everyone. This one is. I know the problems that money can cause in people's lives and this book is all about casting away those problems. Read this book. There are somethings in it that are unnecessary, but the concepts in this book are simple and priceless. If you have any questions on the book don't hesitate to ask me a question. I would be more than happy to help anyone that needs it.